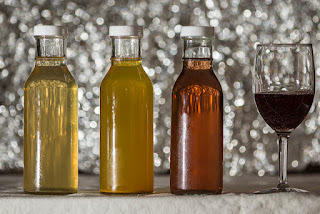 According to Wikipedia, Kombucha refers to "any of a variety of fermented, lightly effervescent sweetened black or green tea drinks that are commonly used as functional beverages for their unsubstantiated health benefits. Kombucha is produced by fermenting tea using a "symbiotic 'colony' of bacteria and yeast" (SCOBY). Actual contributing microbial populations in SCOBY cultures vary, but the yeast component generally includes Saccharomyces (a probiotic fungus) and other species, and the bacterial component almost always includes Gluconacetobacter xylinus to oxidize yeast-produced alcohols to acetic and other acids." and working my way through their flavourings, from Gingerade to Third Eye Chai. Commercial blends tend to be a bit more fizzy than the local brewed offerings or home brewed kombucha. I drink GT's Gingerade kombucha when I've got an upset stomach much as one drinks gingerale for the same reason until I discovered local kombucha and the people who passionately brew "booch." The first local kombucha I tried was Salt Spring Island Kombucha Co. brewed on Salt Spring Island by Lea Weir and her husband. SSI Kombucha Co. started three years ago selling at the local farmers' market on SS Island on a part-time basis until local stores and cafes became interested in selling their kombucha by the bottle. Salt Spring Island Kombucha Co. then moved onto the Moss Street farmers' market. Available in bottles in Victoria at Ingredients, Lifestyles Market, Mother Nature's, Niagara Grocery, Fairfield Market, Peppers, Ageless Living Market, on tap at Ingredients, One Yoga, Fairfield Market, Imagine Cafe, and by the glass at the Drake Eatery. It's also available in Duncan at Duncan Garage and the Community Farm Store, and in Vancouver at East End Co-op, Dollar Grocer and Lana Lou's. Lea brews and bottles Salt Spring Island Kombucha in a commercial facility located beside a lovely organic communal farm. Most of the herbs used in flavouring the kombucha come from the farm and the water used is Mount Maxwell mineral spring water. This creates a delicious authentic kombucha with herbal undertones that play on the tongue. Salt Spring Island Kombucaha, unlike other kombucha, uses yerba mate tea. Yerba mate comes from the naturally caffeinated and nourishing South American rainforest holly tree. Yerba mate contains almost all of the vitamins necessary to sustain life. This makes Salt Spring Island Kombucha, along with the organic herbs and the incredible mineral spring water from Mount Maxwell, one of the most healthful local kombucha products available. Like many people who start drinking kombucha, Lea started drinking kombucha when she was having digestive problems. Her story is similar to my own reasons for having a kombucha habit; often those of us with gluten, dairy or both allergies find relief drinking booch. It truly is a miraculous drink, for those of us who get hooked, helping with maintaining health gut, healing from allergies that have played havoc with one's gut and for balancing gut health after taking antibiotics. My favourite flavours are the Lavender Mint, a light refreshing combination of herbs that play well with the tartness of the kombucha; and the Hibiscus Lemonbalm which contains two of my favourite herbs -- making this flavour my all time favourite. Recommend buying a growler and going to fill up at one of the on tap locations. 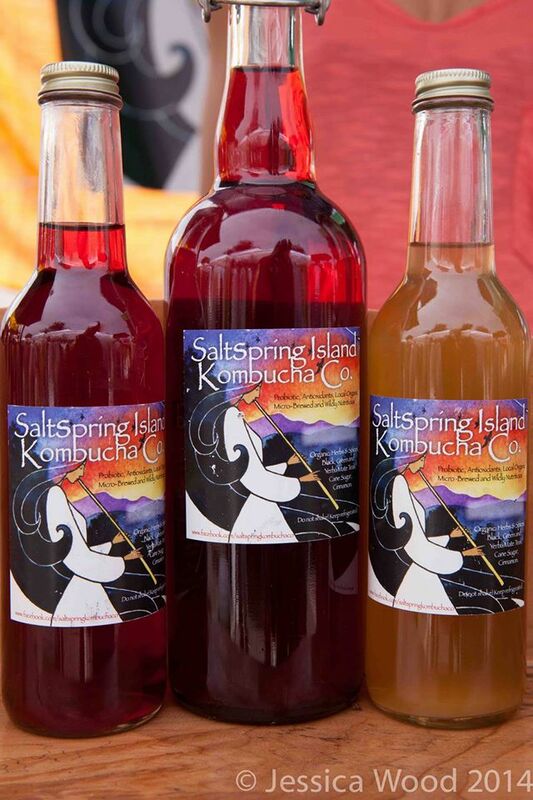 Follow Salt Spring Kombucha Co. on Facebook. Recently I bought my first meowler from Cultured Kombucha through 2% Jazz, filling it with Roll in the Grass. 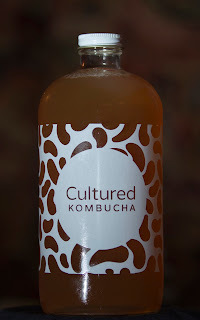 I find Cultured Kombucha to be one of the best local kombucha offerings. The idea behind Cultured Kombucha is to keep recycling the meowler or growler. My meowler cost me $16.00 to purchase and fill, refilling will cost me $11.20. Refill stations are located currently at 2% Jazz in the Hudson at Victoria Public Market, Mother Nature's Market, and Picnic Too. It's also available on tap at Shine Cafe, and Hawk and Hen. Find information on their website Cultured Kombucha or on Facebook. I follow them on Facebook for giveaways, which resulted in winning two meowlers of the Cranberry Lime limited edition flavour brewed for the Christmas/Soltice season. I picked up the contest prize at Cultured Kombucha's brewing location on Rock Bay and met with Christine, the brewer behind this emerging favourite local kombucha. We got to chatting about brewing and drinking kombucha. I shared a pulled pork recipe using kombucha in place of gingerale or beer, and Christine shared her experience of second fermentation flavourings. Christine was raised with a strong focus, sometimes extreme, on whole foods. She has devoted much of her life to experimenting with healthy food. Having spent many years working in restaurants such as Zambri's and the Superior Café, Christine was exposed to a refined method of cooking. With this knowledge and experimentation with healthy foods, it was a natural progression for her to discover the delicious possibilities of kombucha. Christine's driving force behind starting Cultured Kombucha is gut health, and sharing her passion for fermentation, resulting in an infinite and fantastic variety of flavours. From Roll in the Grass, to Fall Into Spice, to the Cranberry Lime and the recent Peach, I can attest all four have been delicious. Peach tastes like summer in a bottle. If you're serious about drinking kombucha, the investment in a Cultured Kombucha meowler or growler is worth the price. A meowler lasts me about a week. I often check the Facebook page to see what Christine has brewed up. The lastest local passionate kombucha brewer I met is Jocelyne Van Horn-Voy, a herbalist who graduated from Pacific Rim College. Jocelyne met me at The Apple Box on Cook Street, where her Enerchi Kombucha is sold, to be interviewed for this article. Enerchi Kombucha is a family business consisting of Jocelyne and her sister, with support from Mom and Dad. Jocelyne starting make kombucha as part of her passion for fermenting. 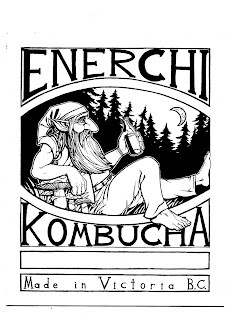 Using a blend of oolong and sencha teas from TeaFarm in the Cowichan Valley (Teafarm) Enerchi Kombucha makes five offerings: Plain, Black Current, Lemon Ginger, Turmeric Black Pepper, and Holy Basil-Rose. For this article Jocelyne offered me four of the flavours: the Blackcurrant; the Lemon Ginger (because lemon with ginger is delicious); Turmeric Black Pepper (since I've been drinking turmeric milk and know the health properties of turmeric); and Holy Basil (since basil tea is a favourite of mine). Enerchi Kombucha is less fizzy than other brands, delicate in flavor, and, when chilled, is the most refreshing kombucha I've tried. The Black Current, Jocelyne's favourite, was a delicious, beautiful deep red, and not overly sweet. I shared the Lemon Ginger with a friend as a morning after breakfast digestive. I'd say this was my personal favourite. The Turmeric Black Pepper with Indian food would be a perfect pairing or with a picnic of egg salad sandwiches after cycling along the Galloping Goose. The Holy Basil-Rose is such a beautiful blush colour. I drank this kombucha as a digestive tonic after a breakfast of spicy poached eggs with Mexican hash. All four flavours showcase Jocelyne's expert herbal blends and the knowledge she has learnt from her herbalist training. 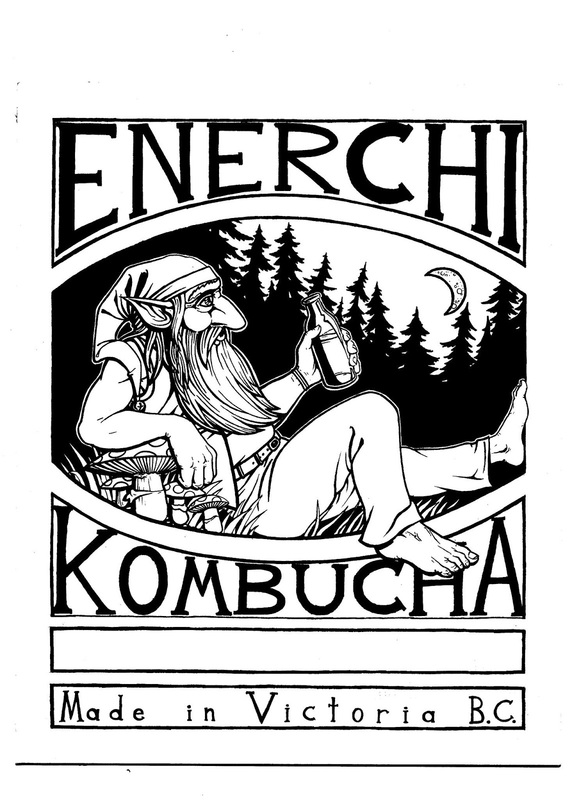 Enerchi Kombucha is available at the Apple Box on Cook Street, the Farmer's City Market in Fan Tan Alley and Solstice Cafe. Thank you to Lea, Christine and Jocelyne for their time and information on brewing kombucha. We are grateful for the wonderful people who share their passion for food and Westcoast living. 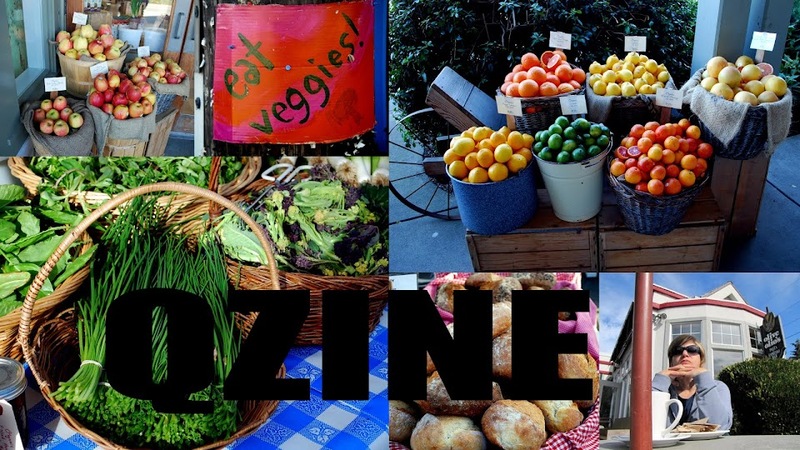 Bringing you appetizing information about Vancouver Island and British Columbia, following my standard of eating local, shopping local, followed by supporting British Columbia farmers and food establishments and lastly buying Canadian food products.